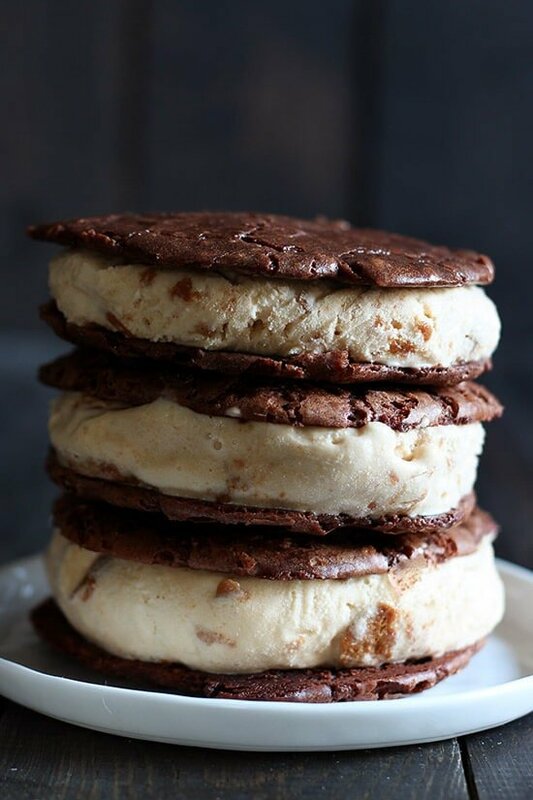 Cookie Butter Brownie Ice Cream Sandwiches have thin yet ultra chocolaty and chewy brownie cookies sandwiching a layer of homemade cookie butter ice cream! Ridiculously good! Tons of ice cream sandwich tips below. Taste: Cookie butter and chocolate are a perfect match in every way. Texture: My favorite part. The ice cream is of course super smooth, creamy, and rich with veins of cookie butter and chunks of Speculoos cookies. But when combined with the thin yet fudgy and chewy brownie cookies, it is absolute perfection. I love how soft the brownie cookies stay even while frozen! Ease: Easy if you already have the ice cream made. Assembling gets a bit messy but it’s soooo worth it. Follow my assembly tips below. Pros: About 10,000 times better than any ice cream sandwich from the store or ice cream truck. Would I make this again? Yes, I can’t wait! If you didn’t think it was possible to turn a perfectly scrumptious homemade recipe like my Cookie Butter Ice Cream into something even more decadent and wonderful, you clearly don’t know me! That is what I’m all about. 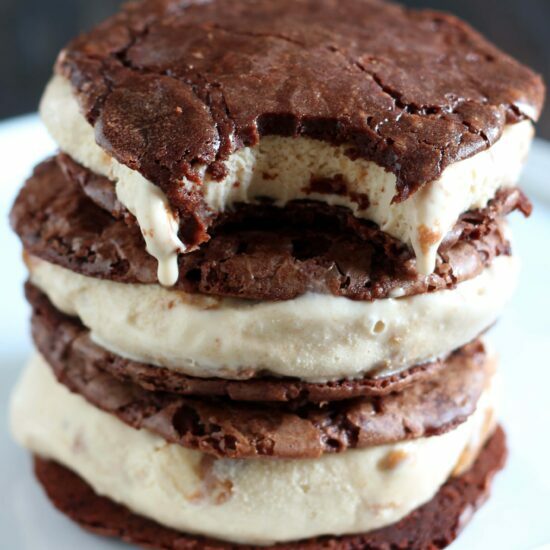 Plus, I can’t exactly make any batch of homemade ice cream without turning it into ice cream sandwiches. After all, I did publish an entire cookbook about ice cream sandwiches AND an eBook about cookies. I’m just crazy like that! I hope you are too because this recipe is a keeper. This recipe is truly incredible. I’m as much about texture as I am about taste and these Cookie Butter Brownie Ice Cream Sandwiches score a 10 in both. You could use store-bought cookie butter ice cream from Trader Joe’s or Ben & Jerry’s to make it even easier, but I of course prefer homemade. 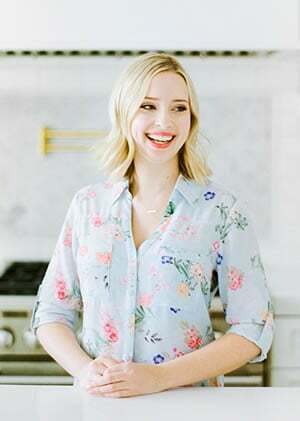 I’ve included some helpful recipe tips below so you can make the most tasty AND beautiful ice cream sandwiches for your next BBQ or get together. Or just for when the craving strikes! Like all my ice cream sandwich recipes, this recipe tells you to assemble the sandwiches ahead of time. This makes for more solid, hand-held sandwiches that won’t turn into a soupy mess before you’ve even taken your second bite. Everything should be FROZEN before assembling. Be sure the ice cream has been stored in the freezer for at least a couple of hours. This way, the ice cream is firm enough to hold its shape but still easy enough to manipulate into perfect little sandwich disks. If your ice cream has hardened too much, just let it sit out for 5 to 10 minutes before assembling. The brownie cookies should also be completely frozen, otherwise they will break and crumble. To make the sandwiches neat and pretty, I like to lie out a large sheet of plastic wrap on my work surface. Take a scoop of ice cream and place it on one side of the plastic. Stretch the other side of the plastic wrap over to cover and use the bottom of a measuring cup or glass to press down on the scoop until it is a perfectly flattened disk that matches the diameter of the cookies. Use your hands to cup the edges to smooth them out. You can make the ice cream ahead of time, the cookies ahead of time, and even assemble the sandwiches ahead of time! They’re a perfect treat for summer entertaining. In a microwave-safe bowl combine the chocolate and butter and microwave in 30-second bursts, stirring between bursts, until melted and smooth. In the bowl of a stand mixer fitted with the whisk attachment, beat the sugar, eggs and vanilla on medium high for about 3 minutes, or until pale yellow and ribbony. Add in the melted chocolate and fold with a rubber spatula until combined. Add in the flour, baking, powder, and salt and stir until just combined and the flour has disappeared. The dough will be more like batter in consistency. Let rest for about five minutes and then scoop dough onto prepared baking sheet about three inches apart. Bake for 8 minutes. Let the cookies cool for 5 minutes before removing with a thin spatula to a wire rack to cool completely. Freeze the cookies until completely firm, at least 1 hour. The cookies can be stored in airtight containers in the freezer for up to 1 month. To assemble, top one cookie with a scoop of ice cream. Place another cookie on top of the ice cream and gently press down to form a sandwich. Sprinkle the sandwich with a pinch of ground cinnamon, if desired. Immediately place the sandwich in the freezer. Repeat for the remaining cookies. Freeze for at least 2 hours before serving. To store, wrap each sandwich in plastic and place in an airtight container. Store for up to 2 weeks in the freezer. Let sit at room temperature for 5 to 10 minutes to soften slightly before serving. It has been INSANELY hot here in Seattle, and I think everywhere else in the world, and all I want to do is hole myself up and eat 3 gazillion of these bites of perfection. Cookie butter ice cream? YES. Pinned! Ummm stop….this is heavenly!! My mouth won’t stop watering. Oh wow, these look insane!! Cookie butter ice cream and brownies?!?! I’m in heaven! I’m trying this recipe and it is not going so well for me. The brownies have been in the oven for probably close to 1/2 hour and are still super mushy. Any idea what might have gone wrong? Thanks so much! When making the brownie cookie dough, what size scoop do you use to scoop out the dough? Just wondered how big to make these. Thank you.